I know Ms. Deen is more than capable of taking care of herself (She told Anthony Bourdain to “get a life.”) Excellent response to his attention-seeking taunts about her dangerous irresponsibility and “disgusting” food. Like he NEVER cooked with butter? Or ate something that looked totally disgusting (baby bird eaten whole, including guts and feet, anyone?) However, she’s really been taking some major hits lately…hits that are often mean, petty, and just downright wrong. The problem is that sometimes “fat free” is also, well, taste free. And to make up for that lack of taste, food manufacturers tend to pour other ingredients — especially sugar, flour, thickeners and salt — into the products. That may boost the calorie content. Plus, if the foods aren’t that appealing, they may lead to overeating to make up for the lack of satisfaction. ANYWAY, the other day I found myself gettin’ into a ruckus with some folks on Facebook re Ms. Deen and her recent announcement she has Type 2 diabetes. Reading the outraged comments you’d think she’s been driving to people’s homes and forcing them to gorge on sticks of butter (with a side of deep-fried lard) at gunpoint. And, how DARE she profit from her illness? (She’s now a spokesperson for her diabetes medicine.) Oh. Please. Like none of us have ever eaten something we full well know is bad for us…and loved every minute. Or, we wouldn’t take the money for promoting a medicine or product we’re already using. Here’s the thing. That donut burger is only one of many, many recipes offered by Ms. Deen. (The donuts are also an option.) I even use more butter than Ms. Deen does in her delicious Shrimp Florentine and Tomato Grits recipe. Total butter she calls for is about a stick and a half…for eight appetizer or four main course servings. Now, that sounds like a lot (I put more than she calls for in the shrimp), but I guarantee you, if you serve as a main, there will be some leftovers. It’s so rich, you simply can’t eat it all at one sitting (and shouldn’t want to…Hello? Personal responsibility, anyone?) I also tweak the recipe elsewhere (no garlic cheese roll? No problem) but then I know how to cook. Hey y’all. When I learned I had type 2 diabetes, I decided to approach managing the disease with the same positivity and “go get ‘em” attitude I have every day. In the past, I’ve heard so many stories of people like me that let diabetes control their lives, but I didn’t want to let this slow me down. I wanted to take control and have a delicious time doing it. Ms. Deen has a disease. She’s dealing with it and is entitled to a private life. Who knows if her eating habits caused it? It probably contributed; the research goes back and forth on what is, isn’t good for you. I’m not a scientist or her doctor so I’m not qualified to make sweeping pronouncements on her health. P.S. A great combo of good and bad fat is Wild Salmon sautéed (in a very hot pan) with butter. About three to four minutes each side, in three good-sized pats of butter, combined with olive oil (another good fat.) Deglaze with a little red wine for sauce. I had that for dinner just last night. Yum! P.P.S. Really want to get outraged about the irresponsibility of promoting cooking with butter? Read Julia Child, any Julia Child. Or, watch the movie Julie and Julia; you’ll want to rush to the store and buy POUNDS of the glorious yellow stuff. 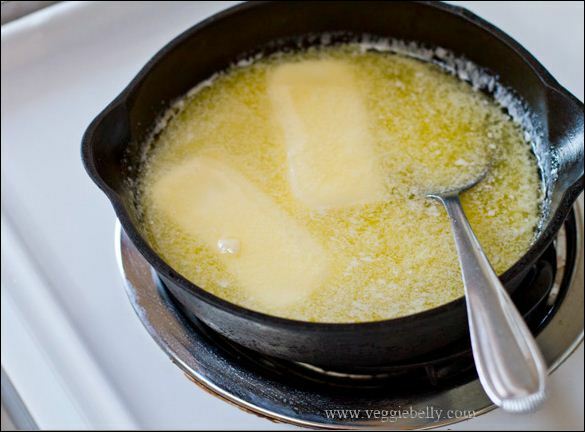 Graphic Image: Veggiebelly.com, illustrating the making of ghee. Tons of vegetarian recipes.